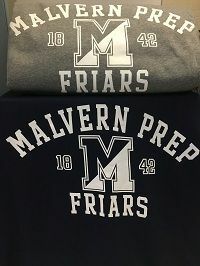 We welcome you to visit our collegiate-like Campus Store, located in the O'Neill Sports Center, to shop our complete collection of Malvern merchandise and Graduation keepsakes. For more information contact Tracy Ryan at 484-595-1125 or email at tryan@malvernprep.org. Our fully customizable blankets are unmatched in quality and design. Made in the USA by a locally-owned company, these blankets are an incredibly soft combination of 76% cotton and 24% acrylic measuring 4 x 5 feet and weighing four pounds. These blankets are fully customizable and shipped directly to your home. Visit the Custom Comfort website to purchase your blanket. A limited selection of blankets are available at the Campus Store for immediate purchase. Our fans can show their support while staying warm and cozy wrapped in this custom-designed, pro-weave fleece sweatshirt blanket. Made in a soft 80/20 cotton blend, it is generously sized measuring 54 x 84 inches and is available in both Navy and Oxford Gray. Celebrate your son's graduation from Malvern with our custom Malvern Prep 2019 Powerbead bracelet. Orders are being taken now, so don't wait to contact the Campus Store at 484-595-1129 to purchase yours today! Order your personalized party favors for your upcoming graduation parties! These items are only available through special order, so make sure to submit your order today! 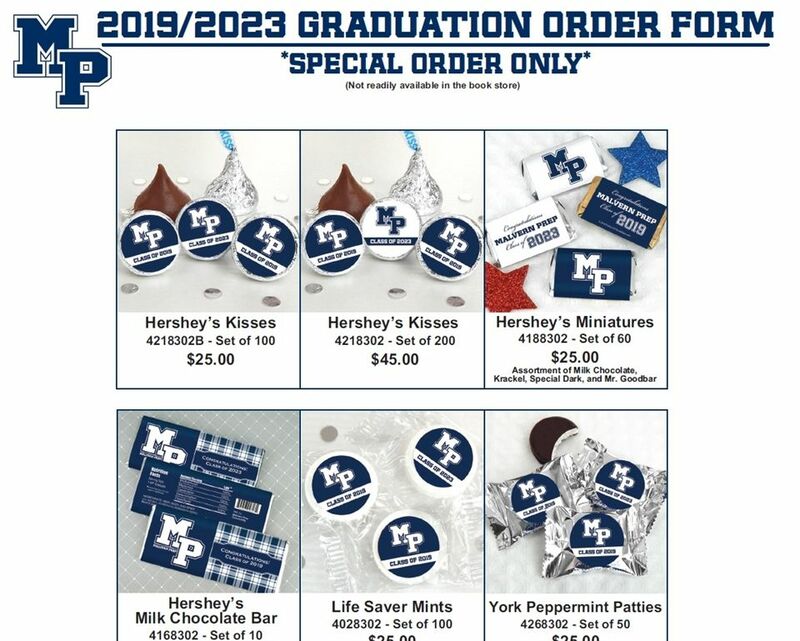 All orders are due by Friday, April 4. 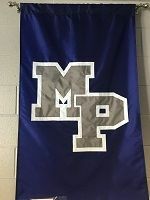 Let your neighbors know which school you support by proudly flying your custom-made Malvern Prep flag. This sturdy nylon flag measures 2.5 x 4 ft. with a sewn pole pocket. A gold version of the one presented during the Freshman Brotherhood Ceremony. 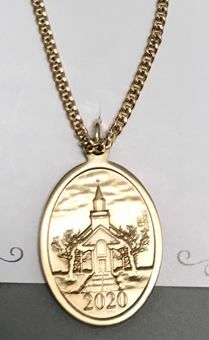 This 14K gold-filled medal and chain (24 inches continuous) features the Chapel and graduation year on one side and our patron Saint Augustine on the reverse side. Orders can be placed by contacting the Campus Store directly and will arrive in approximately four weeks. 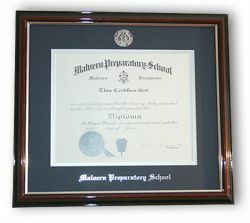 Display your Malvern Prep diploma in this beautifully crafted frame customized with the school name and seal. 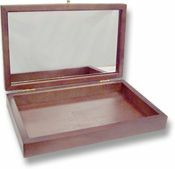 Frames are constructed with a distinctive cherry finish and a True Conservation Museum quality mat board for archival presentation, providing the ultimate protection from damaging containments. A simple hanging system for accurate display is included. 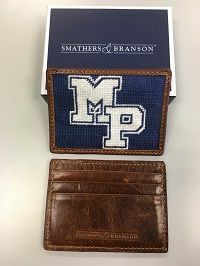 Our custom wallet measures 4 x 3 inches and features a beautiful needlepoint exterior with finished English bull hide interior tanned in Italy. The wallet has two bill compartments and accommodates six credit cards making it a special gift for any occasion. For those who want a more compact version of our bi-fold wallet, the Credit Card Wallet offers a slimmer alternative and features three credit card slots providing ample space for cards and cash. The perfect accessory for the well-dressed man and special occasions, these silver-plated cufflinks feature 100% an MP hand-stitched needlepoint design. 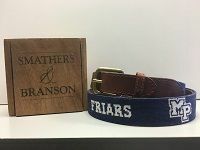 This gift-worthy, custom handmade needlepoint belt is 1.25 inches wide and made with full-grain vegetable tanned Italian leather and a solid brass buckle. 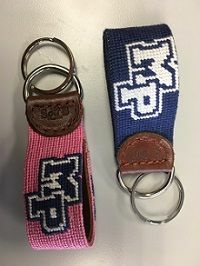 The perfect gift for the new driver or to colorfully display your Malvern Prep pride, this custom handmade needlepoint key fob is made of full-grain, vegetable tanned Italian leather with a sturdy ring and is just the right size to fit into your pocket or purse. Available in navy or pink. An exquisite cherry finished hardwood box fully customized with full-color Eglomise style art depicting your choice of three iconic Malvern buildings: Our Mother of Good Counsel Chapel, the St. Augustine Statue, or Austin Hall, as well as three lines of personalization. The inside of the box measures 8.5 x 7.5 x 2.5 inches and features a mirror on the underside of the lid. This beautifully crafted desk box makes an excellent gift and handsomely displays your Malvern Prep mementos in both a useful and tasteful manner. 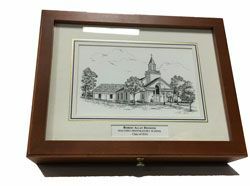 An exquisite pecan finished hardwood box fully customized with your choice of full-color or antique pencil drawn Eglomise style art depicting one of three iconic Malvern buildings: Our Mother of Good Counsel Chapel, the St. Augustine Statue, or Austin Hall, as well as three lines of personalization. The inside of the box measures 11.25 x 8.875 x 2.5 inches and features a mirror on the underside of the lid. This beautifully crafted desk box makes an excellent gift and handsomely displays your Malvern Prep mementos in both a useful and tasteful manner. The inside of the box measures 13.75 x 8.75 x 2.5 inches and features a mirror on the underside of the lid. This beautifully crafted desk box makes an excellent gift and handsomely displays your Malvern Prep mementos in both a useful and tasteful manner. Full-color Eglomise style art depicting your choice of three iconic Malvern buildings: Our Mother of Good Counsel Chapel, the St. Augustine Statue, or Austin Hall. The traditional style frame is finished in a hand-leafed silver and measures 15 x 10 inches. Complimenting any decor, this custom artwork is sure to be a cherished gift. 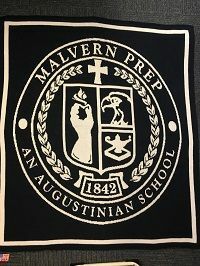 Cozy up with our custom Malvern Prep pillow. Unmatched in quality and design and made in the USA by a locally-owned company, this pillow features an incredibly soft combination of 76% cotton and 24% acrylic and has a removable, washable cover. The perfect compliment to our customized blankets! Show your school spirit with one of the many hats and visors available in the Campus Store! From the popular Under Armour official NFL winter pom-pom hat to our new Under Armour Friar logo baseball hat, we offer a wide variety of colors and styles for both men and women. Generously sized Navy blue mug is available with either the School Seal or Friar/"Pray Like a Champion" logo. 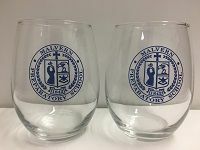 These beautiful glasses are sold as a set of two and feature the Malvern Prep School Seal. Packaged in a handsome white box they make a great gift for any occasion. These gorgeous bracelets are the perfect gift and come in a wide variety of colors and embellishments to compliment anyone's personal style. Created by a local artist during her path toward healing and recovery from a serious accident, the beads of each one-of-a-kind bracelet are said to have unique healing powers. 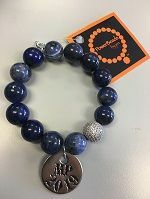 Whether you choose our MP signature bracelet offered in Navy or White, one from our selection of colored beads, or both, you can stylishly show off your school spirit!